With “The Bizarre World Of Frank Zappa” tour set to kick off next week–April 19 at The Capitol Theater in Port Chester, NY–tour producers Eyellusion and the Zappa Family Trust have shared this new preview clip (from last week’s tour rehearsals) of the immersive, multi-media two-hour experience. Watch here. 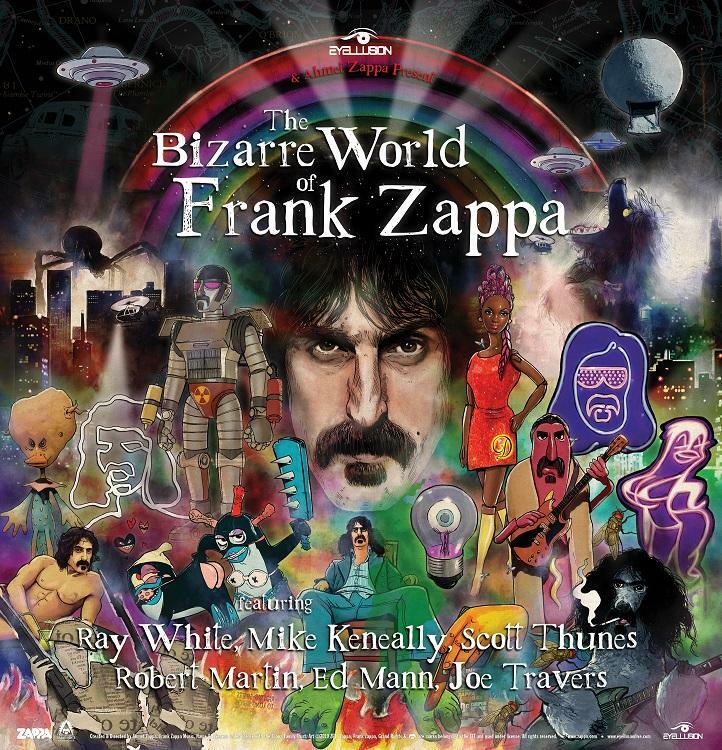 Capturing the artistic visions of FRANK ZAPPA, the first of its kind live show pairs performances–comprised of a band that’s a who’s-who of ZAPPA fan favorite musicians–alongside various incarnations of the tour’s namesake. The “Bizarre World of Frank Zappa” tour band is comprised of former ZAPPA bandmates for this monumental series of shows. The touring unit boasts guitarists Ray White and Mike Keneally, bassist Scott Thunes, multi-instrumentalist Robert Martin, percussionist Ed Mann, and drummer and ZAPPA archivist Joe “Vaultmeister” Travers. Many of the images stem from a 1974 session when FRANK ZAPPA transformed his Los Angeles rehearsal space into a sound stage and cranked out some unbelievable performances seen and heard only by the camera operators in the room. The audio from these performances–locked away in the ZAPPA vaults for 44 years–will serve as the basis for the show. The nine U.S. shows kick off Friday, April 19, with seven European shows in May to follow. Additional dates will be announced in the coming months. Click here for tickets.